The brilliance of the finish on this 2" torch medal is highlighted and framed by black and gold stars & stripes that circle the torch at the center of the medal. The ring at the top allows it to be easily attached to the ribbon of your choice, and the back can be personalized for your event to recognize outstanding performance. MidNite Star Medals are available in Bright Gold, Bright Silver and Bright Bronze. Is it a person, or is it a star holding a torch inside this bright gold flame. 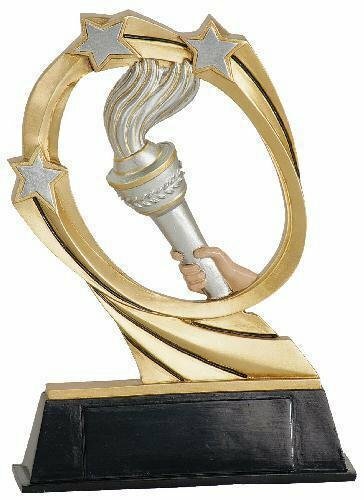 Either way, its a unique figure design, and attached to a round black plastic base, it makes a beautiful, budget friendly award appropriate for any event. Personalize the base to recognize and honor your top performers. These bright, vibrant 2" medals feature sport scenes framed by a multi-design border. The back of the medal can be engraved to personalize for your event or team members. BriteLazer Sport Medals are available in gold, silver and bronze. This full color resin features an oval swirl of silver and gold shooting stars orbiting a silver and gold torch giving this piece a sense of motion. Add a personalized plate for your event for a modern, budget friendly award that is out of this world. A gold torch with a victory "V" in the background stands off the surface of this ½” thick diamond resin plate for a 3-D look. It comes with a metal peg that can be screwed into the back for a free-standing award, a ferrule on the bottom to mount to a base or trophy, or you can leave the peg off and mount the diamond to a plaque for 3 entirely different applications. However you chose, just add a personalized plate for a unique award. Step outside the box with these ultra-modern flame sport medals. The medals feature a sport scene bordered on the bottom by a wreath cutout design. The back of the medal can be personalized for your event or team members. Flame Sport Medals are available in bright gold, antique silver and antique bronze. This stunning medal design features a Victory torch encircled by a frame of 10 shooting stars. The ring at the top allows it to be easily attached to the ribbon of your choice, and it can be personalized on the back for your event. This is a budget friendly award for excellence that will surely be cherished by the recipient. The medals are available in antique gold, antique silver and antique bronze.